Kudos to the awesome Ashley Hughes for this super cute graphic! Just in case you hadn't noticed, TpT is extended it's Cyber Monday sale into Tuesday! LOVE!! I've already been shopping and as soon as I wrap up this post, I'm going back to get the rest of my wishlist! I wanted to make sure you knew about a couple of things I've listed recently in my store (including a freebie!). All together, the bundle is worth $18 but I've priced the pack at $15. With your Cyber Monday code (CMT12) and a 20% discount from me you can get it for closer to $13! Note: If you already own these units, there's no need to purchase this pack. It's just a bundle of the 4 packs for a lower price. 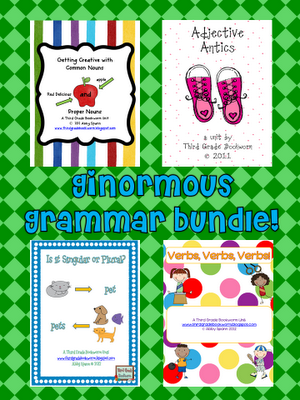 Perfect for 2nd, 3rd or 4th grade! I'm really excited about this. My kids love, love, love explanatory writing. I try to make sure that when it pops up in our curriculum map we do something hands-on that we can write about. I've posted before about using Ginger Snaps unit on How to Make a Coke Float and borrowing ideas from The Teacher Wife to write about How to Blow a Bubble. 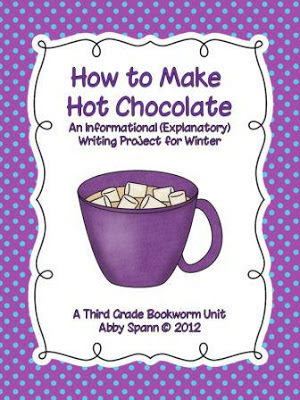 When I thought about how to work in explanatory writing during the winter months, writing about how to make hot chocolate just seemed like a great idea! This craft-ivity is included in this packet, but I'm also offering it for free in my store. What are some of your favorite finds from Cyber Monday? I'm still shopping - I'd love to hear about them!